If you cannot tend to your garden as much as you’d like, you’ll benefit from the AeroVoir which allows your plants to have an ideal water source without any hassle. The AeroVoir can be positioned beside or behind your AeroGarden (works with all models), keeping your garden watered to the desired levels. As the plants mature they will start to require more water. If you take vacations often, you can be rest assured that your plants will be beautiful and plenty when you return, just as they were when you left. 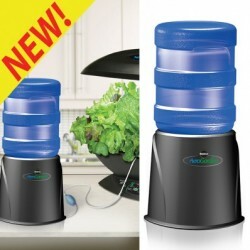 Provides up to 4 weeks total of watering intervals. Easy to use, with built-in primer pump.